We differ quite a bit on this one, Alan; but I'm very much with you on your first few comments about Zemeckis's CGI "innovations". 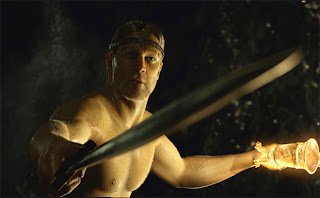 In my own review of Beowulf (http://apennyinthewell.blogspot.com/2007/11/beowulf-pg-13.html), I do a lot of complaining considering how much I enjoyed the film. Why not live action? But I felt it was a grand adventure film. In a more classic sense, when adventure wasn't supposed to have depth of meaning. It was just a rollercoaster ride of fun. You do, however, make a very good point about the missing second act. Perhaps skipping over Beowulf's downfall is why Gaiman and Avery go out of their way in the beginning to show many of Beowulf's flaws. His story about the sea-beast is obviously exaggerated in his own telling of it, so you know he is full of hot air very early on.